With relentless positivity, full-on authenticity and a punk rock thunder spirit, author Jeff Leisawitz pulls back the curtain on the creative process and reminds us that we are all creative SuperStars. It’s time to get off the couch and get on the path. It’s time to tap into the cosmic heartbeat that thumps in your chest and shines from your soul. It’s time to get NFA. My mind is leaping for joy and dancing 'round the room right now. Just finished reading it, going to read it again tomorrow, and possibly again the next day. Wow, what a great book. I soooo needed to hear what he had to say right in this moment. Cheese and rice what amazing timing that was. Thank you! and More Please! I read the whole book in one sitting because I literally could not put it down. It's so delightful, fun, non-preachy and on point. When you read this book you feel like the universe is rooting for you, sending you a message of love and reminding you what you are capable of when you have a vision and are not f*ing around. Even people with great talents, and immense drive, falter, flounder and fail. 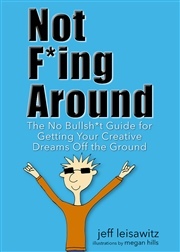 This little gem of a book will put the wind back in your sails and get you juiced about the journey ahead. We all have dreams many of us who are not f*ing around need a plan, and some inspiration. This book is so universal you will want your partners, friends and children to read it when old enough..Such a fast, fun and wise words!! Grab your copy, You will be glad you did!! Irreverent & Inventive. Logical & Laughter. Useful & Unique. I really like the way Jeff tells it like it is. No holds barred. His language is sometimes unfiltered but very fitting to the occasion. It made me 'listen up' at those times he wanted to make sure got his point. Jeff's writing style is no bulls*t-elegant and easy to read. Following his advice will be work, but what good things don't require the effort.I'm an artist and love what I do, so I'm lucky. Now I have to try to put the NFA second half of Jeff's book into effect, the part about ego and the snot bomb of Ic.Thanks, Jeff, for laying out my raw side so succinctly.